Evolution and social consequences of old age: Infant survival and elders. 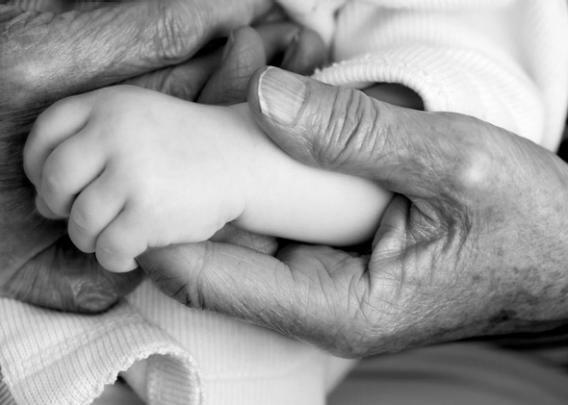 It’s the best time in the history of the world to be a child, a parent, or a grandparent. Read the rest of Laura Helmuth’s series on longevity. The fundamental structure of human populations has changed exactly twice in evolutionary history. 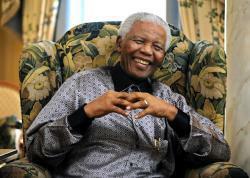 The second time was in the past 150 years, when the average lifespan doubled in most parts of the world. The first time was in the Paleolithic, probably around 30,000 years ago. That’s when old people were basically invented. 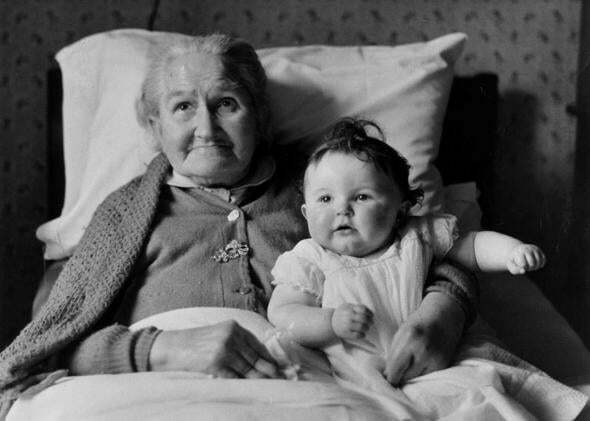 Margaret Roberts, 83, with her 8-month-old great-great-granddaughter, February 1959. No matter how many grandmothers were around during most of human history, though, many children didn’t survive. Until the 20th century, most deaths occurred in children and infants. According to most estimates, quarter to half of them died. We’re now on the other side of the second great demographic change in human evolutionary history. The main reason lifespan doubled in the past 150 years is that infant mortality plummeted. Just as having old people around changed human culture profoundly 30,000 years ago, having infants and children survive has fundamentally changed modern society. 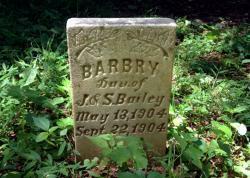 If you walk through an old cemetery, you’ll see all the tiny headstones of nameless infants. Abandoned cemeteries are the most peaceful. The small Bolen graveyard in Shenandoah National Park has about 40 stones that are still legible: Infant son of John H. and Lula Hindall, Born & Died Jan. 15, 1913. Daughter of Waverly H. Bailey, age 11 days. Mollie E. Pullin, Age 7 Years, Gone Home. Some cemeteries are full of infants buried next to mothers who died in childbirth. It’s like strolling through the medieval wing of an art museum: Everywhere you look is Madonna and Child, Madonna and Child. Parents knew they couldn’t expect infants to live. In the United States and other parts of the world, infants often weren’t named immediately; a tradition in China and other parts of Asia is to name a child only after 100 days. According to some interpretations of Jewish law, if a baby dies before 30 days, it never really lived. Was this meant to keep parents from getting too attached to their children? People certainly grieved when they lost a child. In the haunting words of an Alabama cotton tenant: “You ain’t never seen trouble till you lose a young’un.” He had lost seven. An analysis of poems written by parents who had lost children from the 16th century on reveals plenty of grief. But overall, parents’ relationships with their children were fundamentally different than they are in much of the world today. “It was very difficult to invest emotionally because at least half of them would die,” says S. Jay Olshansky, a longevity researcher at the University of Illinois at Chicago. French historian Philippe Ariès popularized the notion that childhood is a modern invention and that until recently children weren’t as coddled or precious as they are today. As infant and child mortality declined, so did fertility. Women didn’t need to bear “replacement children” for the ones who died, and they could be confident that a baby would live to adulthood. Survival became expected. Each child gets his or her own name right away now, and not just the recycled name of a dead older sibling. Infanticide is a shocking crime today. And even though we allow parents to brainwash their children with fundamentalist home-schooling, when those parents choose religion over medical care, we quite rightly charge them with neglect, manslaughter, or—when it happens the second time—murder. Today we go to heroic financial and technological efforts to save every newborn. The United States’ high infant mortality rate compared to other developed countries—about 0.6 percent of all live births, which is tragic but a lot better than the 25 to 50 percent it was in the past—is considered shameful. As Darshak Sanghavi points out, the data are complicated but mostly explained by a high rate of premature births. Neonatal medicine is one of the highest-paid medical specialties (to the point that we may sometimes be doing too much for preemies) and it has made constant improvements in the survival rate of the smallest neonates. Children were the focus of many early public health drives—for clean milk, vaccinations, proper nutrition. Today children’s safety is the motivation for many product recalls, from cribs to window blinds to magnetic balls. Letting them roam unattended is almost as unthinkable as sending them to work in a textile factory. I don’t mean to make light of these precautions—they’re a sign that we’ve become more civilized and humane, that the world is a better and altogether different place than it was more than a century ago, and it’s all tied to our new expectation of long and healthy lives, starting at birth. Economists fret about declining birth rates in the developed world and the challenge of financially supporting large elderly populations. But old people are awesome. Having a high ratio of older to younger people isn’t just a consequence of living in peace and prosperity—it’s also the foundation of a civilized society. Things go horribly wrong in societies composed largely of young people. The Lord of the Flies is fiction, but the Lord’s Resistance Army is all too horrifyingly real. One of the worst centuries in recorded Western history is the 14th, a time of Black Death, famine, and endless war between England and France. As Barbara Tuchman points out in A Distant Mirror: The Calamitous 14th Century, one of the reasons the Hundred Years War lasted a hundred years is that repeated plagues killed off anyone, including kings and other established leaders. Again and again, teenagers or very young people inherited the throne and promptly did stupid, aggressive, frontal-lobe-deficient teenage nonsense like invading neighboring countries. If lifespan is going to continue to increase throughout the world, it may well require a positive feedback loop like the one that allowed humans to flourish 30,000 years ago. As then, more old people may lead to public health and social justice improvements that create more old people, who make the world an even better place. Something to look forward to.